After winning a copy of Knit My Skirt by Candace Eisner Strick on the Yarn Thing Podcast by Marly Bird, I had to share my favorites with you. The book title links to the Ravelry page where you can check out all the skirts, these are just some of my favorites. The designer's last name, Strick, means knit. Many reasons why people don't think they like knit skirts can be fixed by knitting the right size skirt. The rest are fixed by knitting these skirts. Many of the patterns are shown with variations. This is a great way to see how yarn choice affects the garments, and will give you ideas for your own skirts. As soon as I got this book (only a week after winning, Thanks XRX books!) I started matching my yarn stash with skirts. I want to knit and wear most of the skirts in the book. The others have given me ideas for skirts to knit. The skirts are divided by method of knitting, top down, bottom up, or side to side. 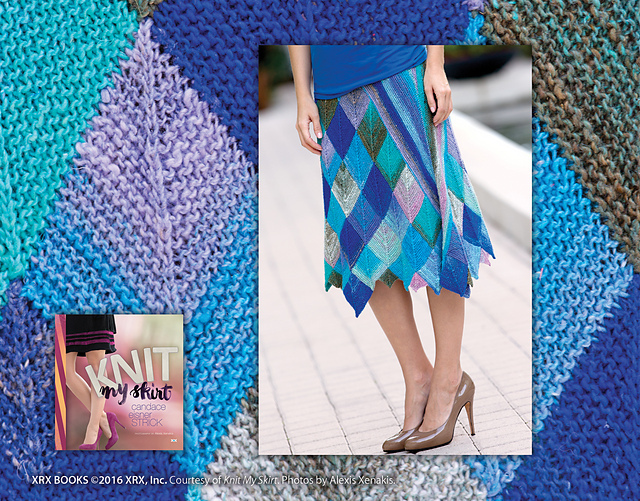 This is the author's favorite way to knit a skirt, with more than half the books in the pattern knit this way. Top down is very useful if you have aged yarn in your stash and want to use all of it, and can't get more. 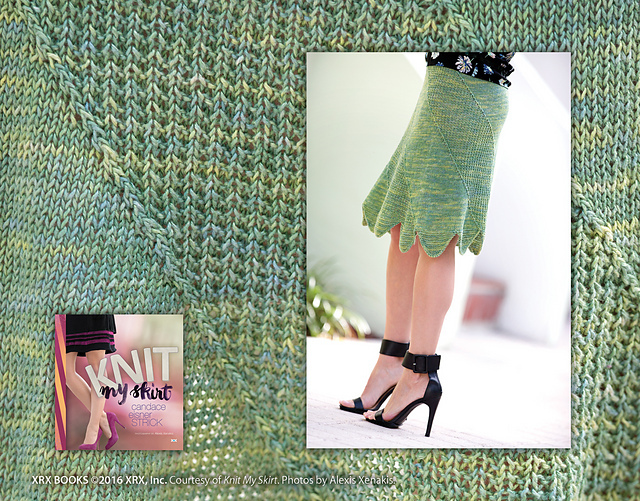 Love the slanted hem line, deep ruffle, and ability to use fun yarn. Such a fun hemline, and great use of texture. Plus I love the color. Color changing yarn does all the work! Can't decide if some yarn I have will be for this one, or the next. This skirt has it all! Great colors and fun hemline are just some of the reasons I love this skirt. Which skirt is your favorite? I recommend getting this book, not just for the great pattern, but for all the tips and help for making skirts you will wear and look great in. Please check for this book at your local yarn store. If you purchase it here, on Amazon, this affiliate link will give me credit. Stay tuned for when is a knit skirt not knit?